One of the objectives of the Irrigation Improvement Project (IIP) in the Nile Delta, Egypt, is to facilitate equitable water distribution and improve on-farm irrigation management by improving irrigation infrastructure. 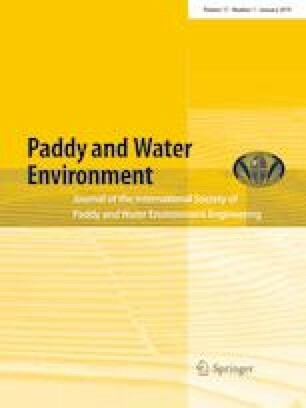 Because paddy rice is a major summer crop in Egypt and it consumes the greatest amount of water in comparison with other crops, the authors focused on monitoring and evaluating the irrigation practices of farmers during summer and examined the extent of sufficient and equitable water distribution in the Dakalt branch canal. Three tertiary canals that had been improved under IIP were selected from upstream, midstream, and downstream along the Dakalt branch canal. Two, three, and one pumping stations were selected from the upstream, midstream, and downstream, respectively, for monitoring pump operations in order to quantify the water supply. Cropping patterns and pump operation records were collected. The irrigation water requirement for each crop was estimated using the UN Food and Agriculture Organization Penman–Monteith method. Water sufficiency (WS), which is the ratio of water supply to water demand, was then calculated, and equitable water distribution among the tertiary canals was assessed based on these results. The mean WS during the mid-irrigation season of June, July, and August for two years at the downstream tertiary canal was 0.75, which was considered to be poor sufficiency, whereas the mean WS values at the upstream and midstream tertiary canals were 0.93 and 0.93, respectively, which were considered to be good sufficiency. The downstream tertiary canal received less water than required compared with the others, and this insufficient and inequitable supply affected rice yields because the average yield downstream in 2013 and 2014 was 7.6 t ha−1, while those for upstream and midstream were 10.0 and 10.5 t ha−1, respectively; this difference was significant. However, WS downstream of the upstream tertiary canal in 2013 and WS upstream of the midstream tertiary canal in 2014 were below 0.8. This was attributed to a drastic change in the cropping pattern at the tertiary canal level and to the insufficient water supply to the tertiary canals. This work was supported by JSPS KAKENHI Grant Numbers JP24248041, JP16H02763, and JP16H05799, and International Platform for Dryland Research and Education, Tottori University and The National Water Research Center (NWRC).